This may come as a shock, but I did not get a long black at the Tea Centre’s store in Sydney. It would have missed the point. The Tea Centre is a specialist tea shop. They have a number of stores around Australia, including three in Brisbane, and specialise in high quality loose leaf tea. There is also a Tea Centre store in Sydney, and unlike most of the others, this one has a tea room, with tea. And cake. The Tea Centre is in “The Glasshouse” just off the Pitt Street Mall. After spending a good part of the day walking around Sydney’s inner city shops it was nice to sit down. 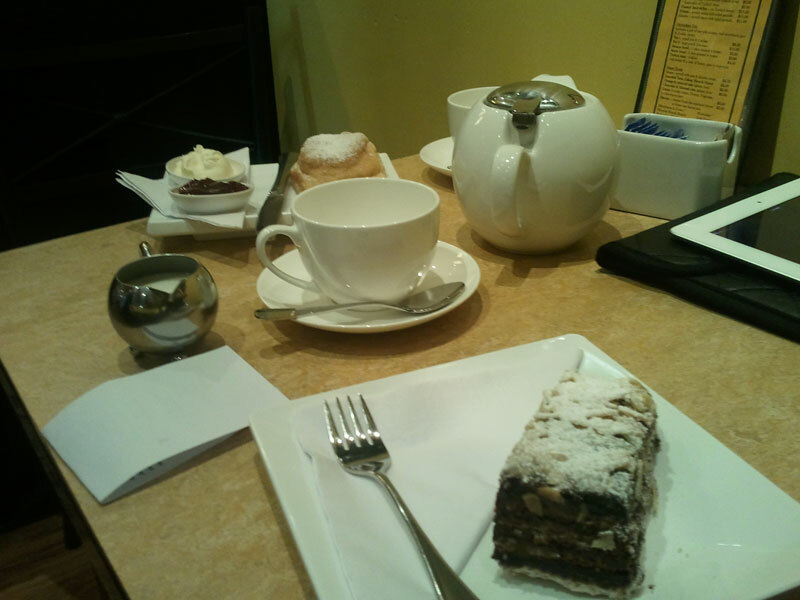 Adding a slice of chocolate and almond cake and a pot of tea was a bonus. My girlfriend is a rabid tea fiend and long-term fan of the Tea Centre, so I let her choose. We ended up drinking Stockholm Blend, which was pretty good. The store certainly looked like a tea specialty shop. Tea and tea making apparatus filled most of the space, barely leaving room for a few tables and an upright cake cabinet. It seemed to be busy with customers both buying supplies for home and stopping in for a drink, but we were able to get a table and place an order without too much trouble. Our tea arrived in a generously sized and rather attractive pot. The pot was large enough for four cups in total, and the cake was pretty good. While all three of the the Tea Centre stores in Brisbane carry the same great range of loose leaf tea, only one of them (Albert St in the CBD) has a tea room like the Pitt Street Mall store. I do prefer coffee, but if you drink tea, be sure to try out the tea from the Tea Centre. It really is very good, tastes way fresher than tea bags and contains no artifical flavours or preservatives (unlike rival chain T2).